A recent study conducted by Policy Analysis for California Education (PACE) found that the first semester of college is a pivotal period in students' academic careers. The study, titled "Beyond Access: How the First Semester Matters for Community College Students' Aspirations and Persistence," followed first-time students enrolled in California community colleges aged 17 to 20 in the fall of 1998. The study, based on system data gathered over a six-year period, tracked graduation and retention rates of first-year students to arrive at its findings. The findings of the study suggest that it is most important to focus on preparing high school students for college and that simply increasing college access doesn't solve the problems faced in building a more educated population and workforce. The study pointed out that although California has more community college students than any state, it ranks below the national average in its proportion of full-time postsecondary students who graduate with bachelor's degrees. The research data showed that 25% of first-time students entering California community colleges with high school diplomas and the desire to transfer to four-year colleges did not return for the spring 1999 semester. Two-thirds of first-time students did not return to college the following year. Out of those who did return, only four in 10 still aspired to transfer to a four-year college. The reason for this, according to Dr. David Neumark, economics professor at the University of California-Irvine, is that "[m]any high schools, not just in California but everywhere, are failing to deliver students to college ready to learn, and that is certainly bad for those individuals and taxpayers who might not be satisfied with what they're getting. Whether it's more efficient to intervene at the community college level with remediation or more efficient to try to fix high schools, it's not entirely clear...It would be great if we could encourage people to stay in school longer." However, Neumark admitted that students' lack of preparation is a tough problem that needs to be seriously addressed. Dr. David N. Plank, executive director of PACE, said, "If we can find ways to support successful transitions for entering students by providing more guidance and academic support, we can increase the odds that they will stay in school and complete degrees." PACE's report can be found at pace.berkeley.edu/reports/PB.07-2.pdf. 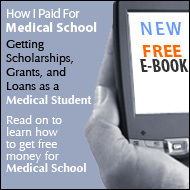 • The Time to Consolidate Federal Medical School Loans is Limited!